Unlike a minestrone, this is meant to be a first course. You can add rice, pasta, beans or increase the amount of potato to make it heartier. Or add pancetta, sausage or ham in the beginning if you’d like a “meat-y” flavor in addition to the vegetables. Heat olive oil in a heavy-bottomed pot over medium-low heat. Add onion, celery and carrot. Cook for 10 minutes, stirring occasionally, or until the vegetables have softened. Add the potato and continue to cook – stirring every so often – until it begins to stick, and the chunks begin to brown, about an additional 5 to 6 minutes. If necessary, adjust the level of heat to prevent the bits of potato that stick from getting too dark. Add the zucchini, a pinch of salt and pepper, and the stock (or water) to the soup pot. Simmer for about 15 minutes over medium heat, or until vegetables are tender. Towards the last 5 minutes of cooking, add the escarole. A kitchen timer is useful for this purpose in case you don’t have one. 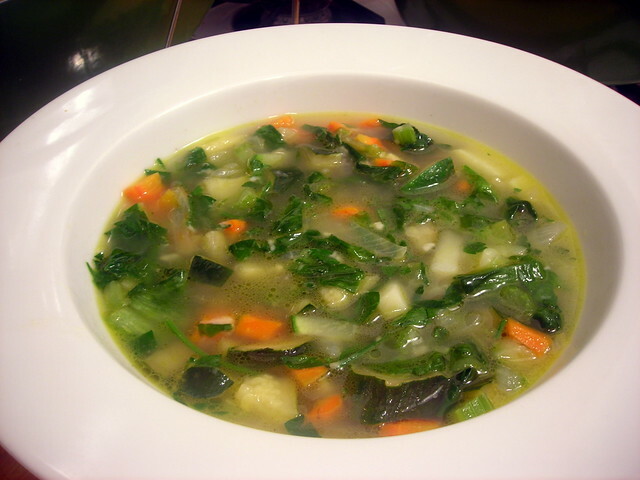 Taste for salt and pepper, stir in Italian parsley, then ladle into soup bowls. Top each serving with a heaping tablespoon of Parmigiano-Reggiano cheese if desired, then serve at once. Time: About one hour, including vegetable prep. It is advisable to make the stock in advance (homemade is best over canned or store-bought); plan for about 6 to 7 hours if you elect to use homemade stock. You can view a recipe for homemade chicken stock here. This is my contribution for Souper (Soup, Salad and Sammie) Sundays for the week of September 10, 2012 to September 16, 2012, a weekly foodblogging event organized and hosted by Deb of Kahakai Kitchen. 30 Aug	This entry was published on August 30, 2012 at 5:56 pm. It’s filed under cooking, food, food photography, Gluten-Free, Italian food, recipe, Souper (Soup, Salad & Sammie ) Sundays, summer and tagged dinner, escarole, food photography, gluten-free, Italian food, soup, Souper Sundays, summer, zucchini. Bookmark the permalink. Follow any comments here with the RSS feed for this post. I adore soup; I would have some every day if I could. I had (three years in a row) the resolution to make one new soup a month. Alas I never met it. It is hard to make ‘just enough for me’ ; my partner does not like soup. You might try introducing it in small portions. What specifically doesn’t he like about it? He is ‘not a soup person” alas. I love the looks of this one, especially since the weather seems to have turned – it’s been rainy, foggy and cool and perfect soup weather. It looks like a healthy and tasty soup. I need to use more escarole. 😉 Thanks for sharing it with Souper Sundays.